In this review I will be looking at 3 different sports applications. Sky Sports News, ESPN Goals and LiveScore. I was thinking of doing a versus, but instead decided that giving an overview of each app would benefit the reader more. I will mostly be covering the football side of the apps (as that is the hot sport at the moment). Upon first opening the app you get a list of all the top sports news (regarding the mentioned sports). The icon in the top left corner takes you to a menu to select a specific sport. Selecting football you are given the top football stories and multiple tabs for Live, Fixtures, Results, Tables and On Sky, most of which are quite self-exploratory with the On Sky tab displaying what matches are being shown on the Sky Sports Channels. The settings tab displayed in every screen only allows the user to change the frequency of the updates. There is also Sky Sports News Radio support. The great thing about the app is it will provide you with sports news for multiple sports in one app. Sky Sports is arguably one of the best sports news sources out there so you know that most of the articles there will be top-notch with some even including high quality videos from Sky Sports News. 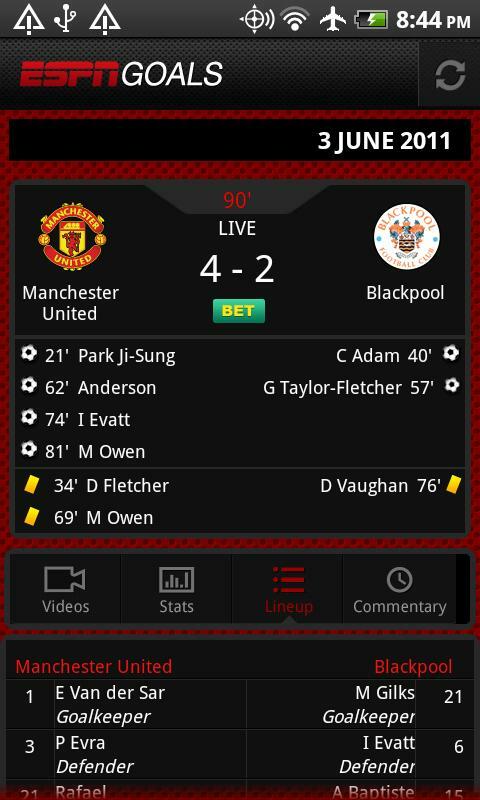 However there are some issues with the app, the biggest one being live score updates. While they do exist sometimes it takes a while for them to get updated (defeats the purpose of live?) and there is no way of knowing who scored which goal or who's been booked or substituted. The same issue is in the results tab. You cannot click on a result to get details of the match, which means if you want to know who scored you have to look elsewhere. The third issue is with the tables tab. Don't get me wrong they offer table standings for over a dozen different leagues but there is no way to select which league. You have to scroll through each one. Getting to group G standings of the Euro Qualifiers will need quite a few taps. Overall it is a great news app that needs a few tweaks on the additional features. This app is specifically about the English Premier League. 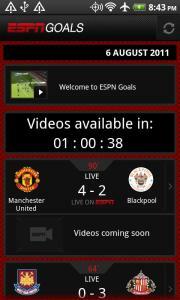 The home screen displays the latest videos and a list of the upcoming fixtures from the EPL (English Premier League). It's unique feature is the video highlights it offers during and after the match unfortunately this is also its biggest let down. I have not managed to get a single video to play in the 2 weeks I've had it installed and from the market comments it seems I am not missing much. Most of the user reviews comment on the horrible video quality. That's not to say that there is nothing good about the app. It has a nice user interface and the option to select your favourite club is a good addition. Another nice addition to the app is the live commentary feature during matches. Unfortunately this is also hindered by how slow the app is to update matches. At least, unlike the Sky Sports News app, it features match details such as goal scorers and bookings, match stats including possession percentages and even full line-ups with substitutes. The substitutions made are confusing to figure out but at least you do get some detail. You can look at all the usual fixtures and results as well. Fixtures being shown on ESPN have the channel written underneath. The problem with the app is its littered with bugs and is not as fast as you would expect. It suffers from random crashed and force closes. If you're not bothered about the videos but like the interface or want a selection of sports (not just football) and want to stick with ESPN have a look at the less buggy, feature packed and overall nicer ESPN Score Center. 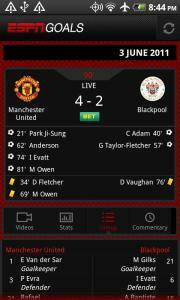 LiveScore is probably the most basic app out of all three but when it comes down to live scores it lives up to its name. I've been a frequent user of the livescore.com website and the app is as efficient as the site. At the moment it only offers live scores for Football and Tennis but they have stated that they are planning on adding more sports in the future. The UI is fairly simple. 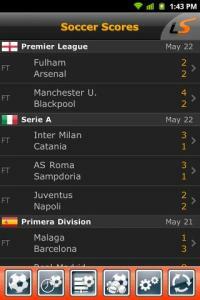 The home screen displays all the live matches you can imagine (from the EPL to Brazil's Serie B) and results of recent matches. LiveScore uses a familiar button interface with the first button taking the user to the home screen. The second button shows only live matches. The soccer menu (third button) gives you a list of all the competitions and countries available in the app and displays their upcoming fixtures and recent results. 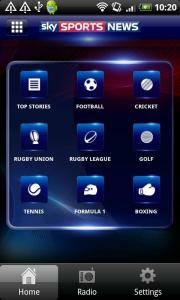 The fourth button takes the user to a sport selector menu (currently only supporting Football/Soccer and Tennis). The settings menu allows you to enable automatic refreshing, select the refresh interval (0-180 seconds) and clear the cached data. The last button is an instant refresh button. When you select a match you are given basic match details. Who scored and what time, who's been booked or sent off and who's been substituted. That is all most people would need but it would be nice to have some match stats also, such as a possession percentage and corners. A feature which is missing from the app is notifications. It offers no notifications at all. I would like the option to select matches or clubs to follow and be notified of any action that is happening during that match or of a match including the selected clubs. With that in mind non of the apps mentioned offer any form of notification but with this being the only app to offer proper real-time live scores it would be a nice addition (I don't want to be notified about a goal 30 minutes after a match has finished :P). 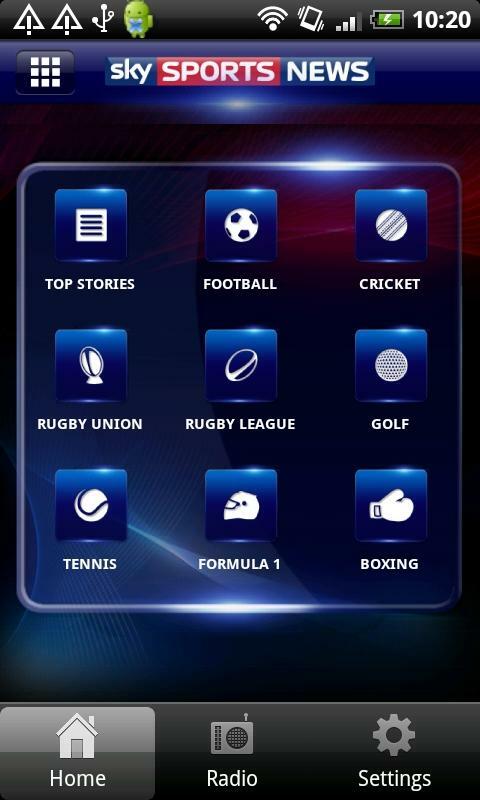 Sky Sports: Offers the best sports news app I have used and I am confident that BSkyB will update the app to improve most of its shortcomings. ESPN Goals: The video highlights would be a nice feature if it was executed properly. There are too many bugs and it is too slow. Use ESPN Soccer Center instead for a better ESPN experience. 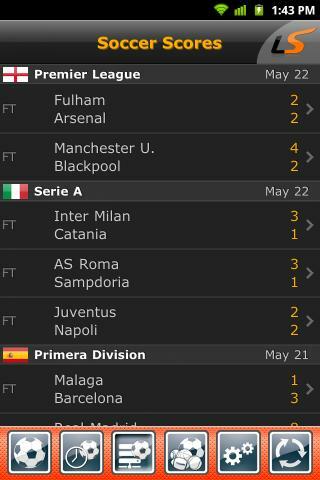 LiveScores: Lives up to its name. 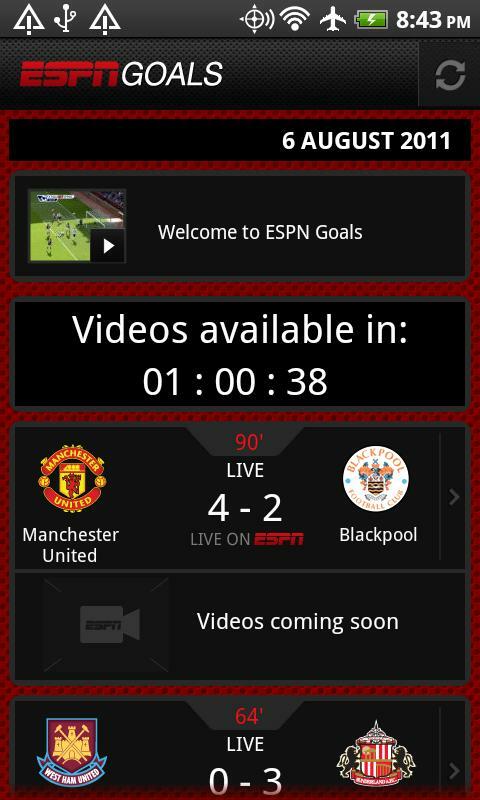 The best option if you want instant live score but could include a couple more features (push notifications).